An immediate continuation to The Adversary (Evans’ contribution to The Sundering series of loosely-tied together stand-alone novels detailing world-shifting events to the Forgotten Realms shared universe), Fire in the Blood is also the fourth novel in her successful Brimstone Angels plot line. I entered into Evans’ series with The Adversary and reviewed it here, explaining that it worked remarkably well for a reader who was unfamiliar with the characters and storyline. Moreover I was staggered over how much I enjoyed her rich characterization and pacing, remarking that it was easy to forget this was a media tie-in, which while frequently fun aren’t noteworthy for originality or depth. Most all of my thoughts on The Adversary held equally true for Fire in Blood. In many aspects I think it is even improved. The one caution I mention is that I’m not sure this would be an ideal entry point if you are unfamiliar with the story/characters. To Evans’ credit, she does a great job at summarizing what has previously passed without making it intrusive on the current story. So it is possible to start here, but not the most logical choice. Go back at least to The Adversary, or as I have just finally done, find a copy of the first Brimstone Angels novel and enjoy the catch up. This is a series for fantasy fans worth investing in even if you don’t read Forgotten Realms, as long as one likes classically styled epic fantasy with compelling characters male and female both. Evans is an asset to this shared universe, and judging by comments she made in an interview in Women Destroy Fantasy!, her style and concerns for diversity may hopefully become more familiar and present in the world of media tie-in novels. 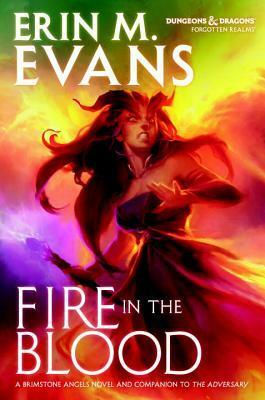 To start with, Fire in the Blood already improves over its predecessor with a more compelling title, an evocative description of Evans’ characters, particularly the twin stars Farideh and Havilar. These women (tieflings) have had difficult lives with various forces mortal and immortal trying to influence and control them, to possess them. Yet despite these forces of the world seeking to define them, they remain strong-willed individuals with fire inside to keep struggling for independence and a bit of their own happiness. The theme of forces larger than an individual forcing people into difficult choices and compromised promises and principals is common to all of the characters in Fire in the Blood and The Adversary. It is the heart of what makes the books so interesting and characters so compelling. The plot of Fire in the Blood adds complexities from previous events, twists and turns that are almost Whedon-esque. Sometimes enemies are not so clear, and assumed friends may not be able to really support someone because of complications in their own lives, plots. I won’t try to summarize all the different plot elements here in the story, the official blurb for the novel is somewhat vague presumably because so much is happening here, much dependent on what has gone before. The plots are a complex web, encompassing a large extended cast of characters that include even additional numbers from the previous installment. Erin Evans is a superb juggler. The pacing stays tight and the various balls of each plot element are kept in play, blending and separating with no breakdown in the trick. All of this while still recovering details of the past to make sure that readers don’t become lost. Impressive. In The Adversary one of the things I didn’t enjoy much compared to the rest was her male characters. They seemed to be stronger ‘types’ than the females, not as rounded, and not nearly as interesting (except for Lorcan) compared to the others. In Fire in the Blood these male characters grew more on me, particularly due to escalating dilemmas for the character of Brin who is facing engagement to a royal, and his heart isn’t really in it. As I became invested in more and more of Evans’ characters the more the entirety of the plot and the world opened to me, like the best of epic fantasy reading experiences. A healthy mixture of action, romance, and rich characterization in a nicely readable package makes this one that I’m looking forward to rereading within the order continuity as I go back to start at the beginning before the next volume comes out. Disclaimer: I received a free advanced reading copy of this from Wizards of the Coast via NetGalley in exchange for an honest review.